Regardless of design styles (modern, classic, rustic, etc. ), houses have quite an amount of different design features to choose from. High-pitched roofing or flat? Concrete or wood? Iron railing or glass balustrades? All of these decisions need to be made (sometimes by the architect, other times by the homeowner, and occasionally it’s a mutual coming together of ideas), and they impact not only how the clients will experience living in the house, but also how the outside world will perceive the house. 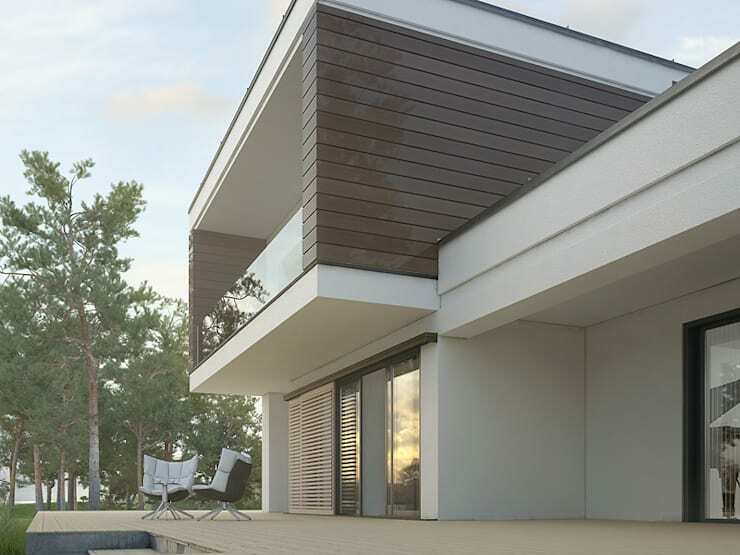 Today’s showcase on homify 360° has no need for concern, as every little surface of its facade is perfection. Polish geniuses Domy treat us to a modern home right next to the beach, yet it’s not the ocean view that has us ogling this stunner. No overt embellishments, no unnecessary bells and whistles… just pure straightforward style that is not trying too hard. 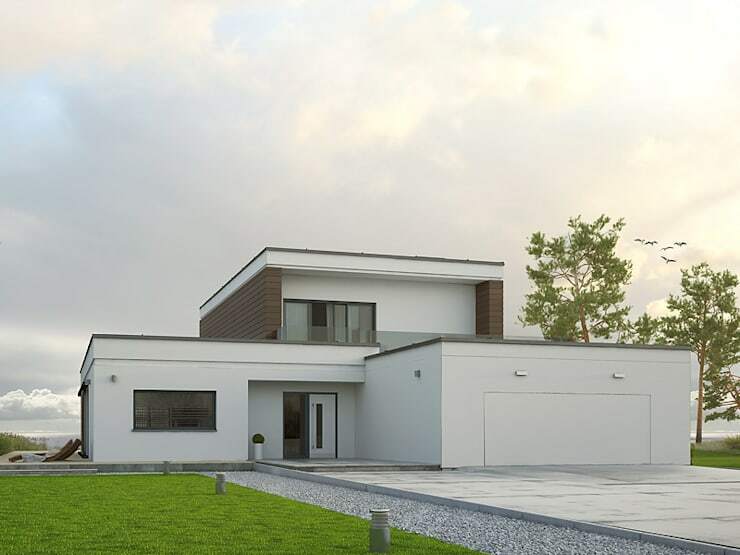 Distinctly modern, the house shows a clean lined design that draws the eye to all the right places. It’s a handful of rectangle shapes that come together to make up a stylish living space, with each one presenting his own set of features and characteristics. 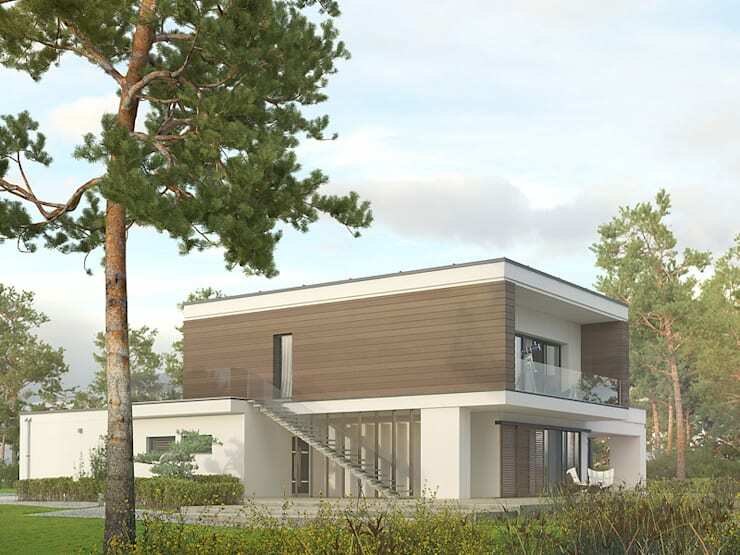 The elegant two-storey house features a flat roof, and is ideal for a four-person family. Notice how bright those white tones become when paired with the fresh green lawn – is this not the perfect face of modern living? Simply stunning! This side view of the house shows us how it flaunts a volume of wooden panelling with utmost style. Although we’re only taking a sneak peek at the exterior facade, it’s interesting to note that the house makes use of an open living area on the ground floor, ensuring that the living room, dining area, and kitchen (with accompanying pantry) are all comfortably close. In addition, a bathroom and dressing room can also be found, and that garage we saw earlier is spacious enough for two cars. The first floor is where we find the private areas of the house: two bedrooms, each with its own dressing room and bathroom. From this angle we get a fabulous glimpse of the top terrace (complete with glass balustrades) that features along the side and front of the house, connected to the bottom deck via an ultra modern open-riser staircase. The back side of the house, which views the beach and ocean. Is that upstairs balcony not pure perfection? Imagine taking your morning coffee with that view! An abundance of glass sliding doors ensure that the beach view is a permanent feature for the owners, plus allows a fantastic dose of healthy sunlight (and crisp sea air) to flow inside. Wooden shutters have also been added to the bottom glass doors, ensuring safety in case of those strong ocean winds, as well as some shade during the day. Our personal favourite: this wooden deck with its ultra comfortable seating, where you take your glass of wine to admire the view and breathe in that fresh, salty sea air. That slight overhang makes for a decent little shaded area, should that beach sun become a little too hot for comfort! 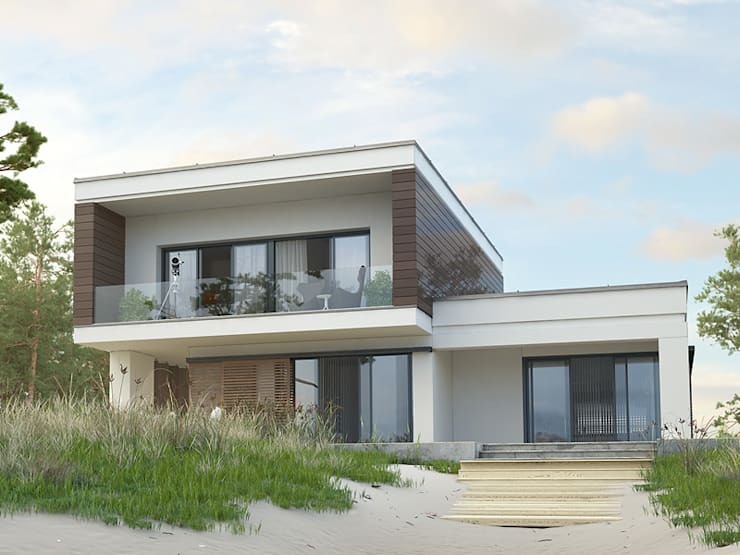 Want to see more beach houses? Then treat yourself to: An Eastern Cape Home with Champagne Views. Love it? Well we certainly do, but we want to know what you think of the house. Share your thoughts with us in our comments section below.